TANA would like to inform you of an upcoming discussion with Juan R. Fuentes and Jos Sances on Serigrafia on Wednesday, July 30th at the San Francisco Public Library. 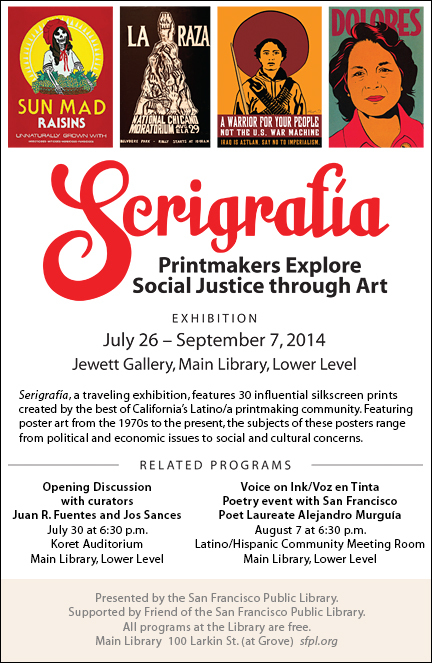 Serigrafia, is an exhibition of silkscreen prints from California’s Latino/a printmaking community. The exhibition features posters from the 1970s to today, the subject of these posters range from political and economic issues to social and cultural concerns. Topics include economic justice, agricultural boycotts, the Occupy Movement, imperialism, human rights, civil liberties, solidarity movements, and cultural celebrations. The exhibition features the works of TANA Co-Director Malaquias Montoya and TANA Assistant Director Gilda Posada. Furthermore, TANA Co-Director, Carlos Jackson served as one of the co-curators for this exhibition and has published an article in BOOM: A Journal of California about Serigrafia. Serigrafia, has traveled to Davis, Fresno and Pasadena, and will now be on display from July 26- September 7 at the San Francisco Library. TANA would like to invite you to the Opening discussion with Bay Area co-curators Juan R. Fuentes and Jos Sances, for more information please click here.